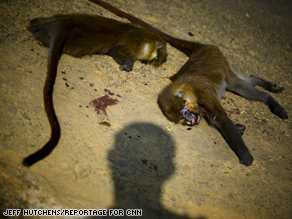 Faced with limited food sources, Central Africans are forced to kill "bush meat"
NYABBISAN, Cameroon (CNN) -- The animals are gone. Hunters facing food shortages in Central Africa push deep into forests for food, exposing themselves to viruses. Deep in a remote region of Cameroon, we are following two hunters looking for bush meat -- forest animals they can kill to feed their families. They've spent hours in the forest already, but all the traps they've set are empty. They will have to push deeper into the forest and they may be hunting for days. World-renowned epidemiologist Dr. Nathan Wolfe is following the hunters. "Individuals have been infected with these viruses forever," Wolfe said. "What's changed, though, is in the past you had smaller human populations; viruses would infect them and go extinct. Viruses actually need population density as fuel." The most prolific and deadly zoonotic is HIV, the virus that causes AIDS. In 1999, scientists at the University of Alabama at Birmingham traced the origins of HIV back to a subspecies of chimpanzee. Scientists think that the virus might have jumped to humans when the blood of an infected chimpanzee came in contact with the blood of a bush meat hunter during the killing or butchering of the animal. It took decades, but that simple, seemingly insignificant transmission set off a global epidemic, or pandemic, that so far has killed or infected tens of millions of people. Scientists think HIV probably crossed into humans as far back as the early 1900s, but it wasn't until air travel became common that the virus spread, and AIDS became a global epidemic in the 1980s. "We're now so profoundly interconnected that it will be the case things will enter into the human population and will spread globally," said Wolfe. The centerpiece of Wolfe's work is trying to stop the next pandemic before it starts. He's using a recent $11 million grant from Google and the Skoll Foundation to continue something called the Global Viral Forecasting Initiative or GVFI. It's a kind of early-warning system to track the transmission of viruses in virus hot spots around the world. In addition to Cameroon, Wolfe has teams in the Democratic Republic of Congo, China, Malaysia, Madagascar and Laos. iReport.com: What little things can you do to save the planet? Wolfe likens his work to the way an intelligence service tracks threats made by potential terrorists. His teams cross-reference the different viruses jumping over into humans - what he calls the viral chatter. By doing so, they can identify previously unknown viruses and perhaps stop them before they spread. iReport.com: What are you doing to save the planet? One zoonotic virus that Wolfe and his team are paying particularly close attention to is called monkeypox. It's a virus that intermittently flares up in Central African countries; last year it killed more than 20 people in the Democratic Republic of the Congo. It's unlikely the current viral strain of monkeypox could become a pandemic, because it loses strength as it passes from person to person. But it spread to the United States in 2003 when some African rodents were imported as pets. Wolfe is most intrigued by monkeypox because its origins are unknown. In fact, monkeypox is one of the many viruses we know very little about. For hunters, like the two men the "Planet in Peril" crew has been following, viruses and science seem remote things to be concerned about. These men and an increasing number of people like them must hunt the forests simply to feed their families. But for the rest of us, with population and food pressures increasing and deadly zoonotic viruses lurking in the forest, what the hunters are doing now has the potential to impact us all.